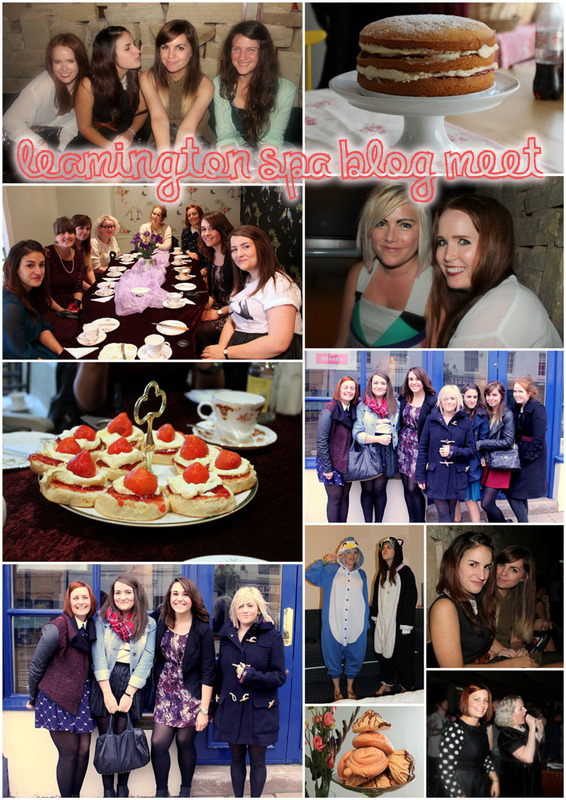 It seems like about a month ago now, but actually it was the weekend before last that I hopped in Bruce the Volvo and drove up to Leamington Spa to meet a bunch of awesome blogger ladies. It was an absolutely lovely weekend filled with lots of cake, chats and fun! Our first stop was a little vintage-y type shop (my favourite kind of shop; one that sells vintage-y bits, stationery, satchels and quirky, kitsch-y things) called Berylune, who kindly let us take over the upstairs room usually reserved for crafting. Not only was tea served in a ginormous metal kettle, but Sarah from A Million Dresses baked and brought with her the most amazing Victoria Sponge I have ever seen/tasted (you can spy it in the top right picture). After lots of gossiping and getting to know each other we headed to the Travelodge up the road which was nicer than hotels I’ve paid three times what we paid to stay in, it was like a grand old country house (well, a country house with a Wagamamas attached to it), it even had bookshelves with old books in in the lift! After we’d dumped our bags we headed to Wagamamas for cocktails, and then after a quick change, went down for dinner, which was YUM. I proper love Wagamamas, need to go to the Bournemouth one more often! We then embarked on a mini pub crawl around Leamo Spa which involved a piano bar for more cocktails, a rowdy pub for pints and then the weirdest club I have ever been to, where there was some dancing that had to be seen to be believed (first from a crazy women and a breakdancing gentleman, then from some bloggers themselves…;). Did I mention there was 90’s gore movies on big screens and a couple of hours of 70’s music? What a night! We then headed back to the hotel (I was in a room with Kim from Sweet Monday and Katy from Caught up In Cake… absolute BABES) where the three of us got in PJs (you can see Kigu time above!) and deliberated ordering from the 24hour room service until about 4am! The next day we headed to Vinteas, a gorgeous little vintage tearooms for afternoon tea. There was tea and sandwiches in abundance and we then had scones with cream and jam and were allowed to choose a cake/meringue from their amazing selection. All the food was delicious and it was the perfect way to end an amazing weekend. A MASSIVE thankyou to Sarah for organising it all and meeting us all and making trips to the train station and car park to find us! It really was SO fun and had us all excitedly planning further meetups! My homework is to plan a meet in the New Forest; I am planning camping in yurts, toasting marshmallows and drinking mulled cider – will have to be in Spring though when it’s warmed up a bit!